This alphabet letter O gets kudos for just, well, being cool, in it’s strong pink and purpleness together. It’s got a strong purple with lighter and very small polka dots. 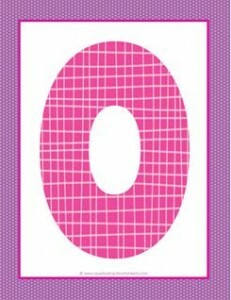 The letter O is an awesome pink with lines going left and right and up and down giving it some texture and design. I’m hoping that you can find a use for it in your classroom or homeschool room where you post the alphabet.